Most of us try to be nice people; we do not always succeed, of course, but we definitely try. There are people, however, who do not even bother trying to be kind to others. Why is that the case? We will never know for sure. It is possible that they were hurt badly, so they decide to try to hurt others. Maybe, for whatever reason, they just lack the ability to be compassionate. There are legitimate medical conditions that prevent a person from empathizing with others. Whatever the case may be, they are out there. Here are twenty people or organizations that just can’t seem to be nice. It is not a well-known profession, obviously, but apparently there are professional mourners out there. A lot of people and families seem to care how many attendees there are at a funeral. 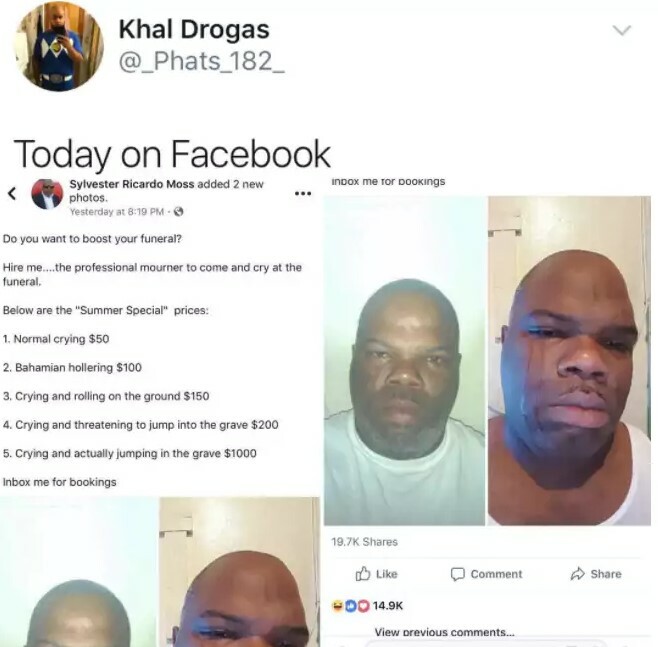 The person in the image above is willing to show up at a funeral and “mourn”, and his prices are a bit outrageous. He seems to think there are people out there who will pay to see him cry and throw himself into a grave for $1,000. You really have to wonder if he has a lot of customers. If he does, that’s pretty impressive. 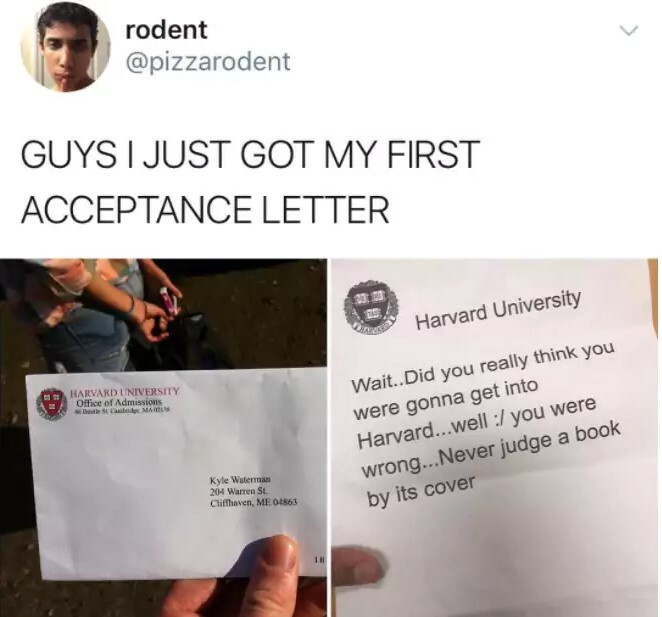 In this image, poor Kyle seemed to think he would get into Harvard University; obviously, Harvard is incredibly difficult to get into. It is an Ivy League institution, after all, and is considered one of the most prestigious universities in the world. The actual letter he received is brutal. Kyle will probably have a good laugh about it one day, but he was probably pretty depressed when he first read it, which is sad. 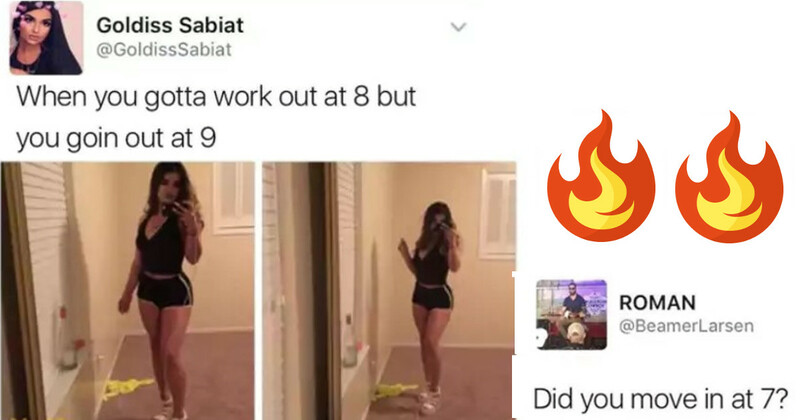 The poor guy in this image clearly has a thing for the girl in this image. 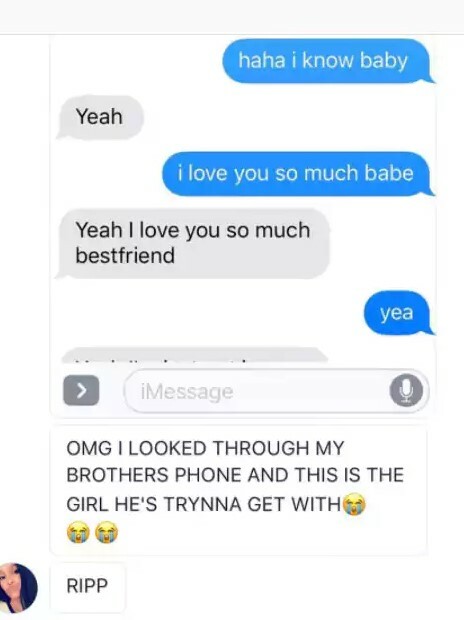 Unfortunately, he is in the so-called “friend zone”. 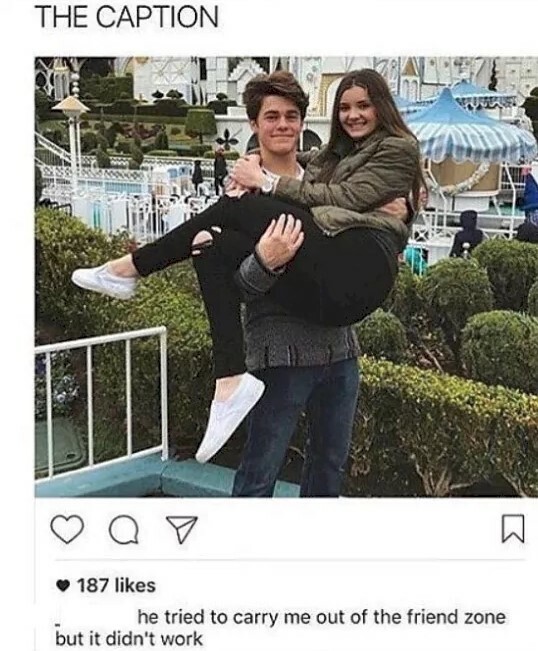 The girl made a joke on social media about how he tried to carry her out of the friend zone—an unsuccessful attempt, apparently, according to her. Making fun of someone who is interested in you on social media is definitely not a nice thing to do to a person. 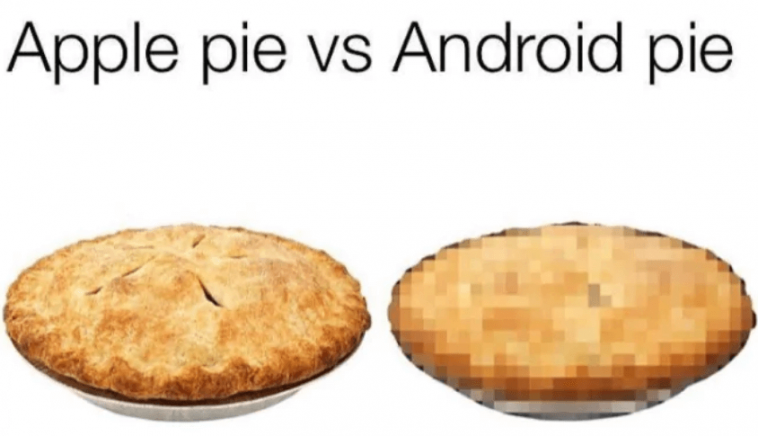 The image is mean, but it is also sort of true. 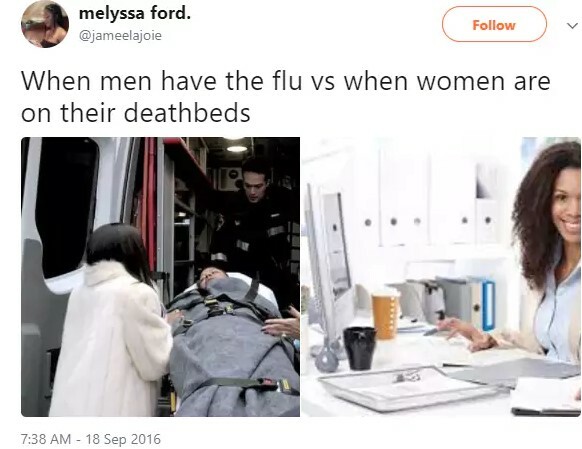 Men do—when they are sick—tend to take things to a bit of an extreme. If you are feeling a bit under the weather and have the sniffles, you should take a day or two off of work so you do not get other people sick. You should not make a big deal out of it. 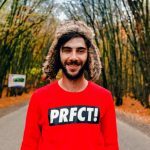 For those who are unaware, Tesco Mobile operates in Ireland, the United Kingdom, Hungary, the Czech Republic, and Slovakia. For whatever reason, Felipe thinks that it is unattractive if a woman uses Tesco Mobile. 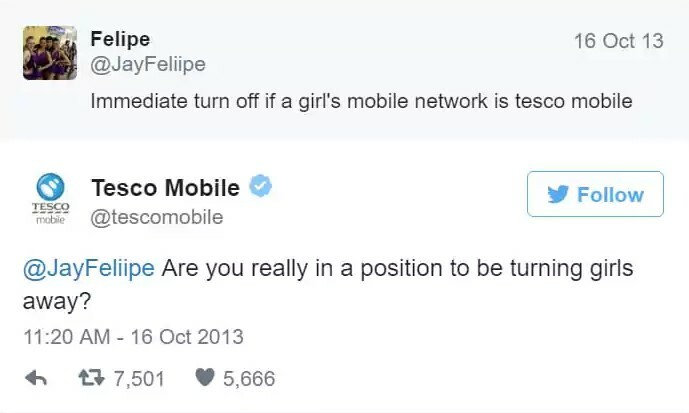 Tesco Mobile is probably right—the guy probably is not in the position to turn away women. 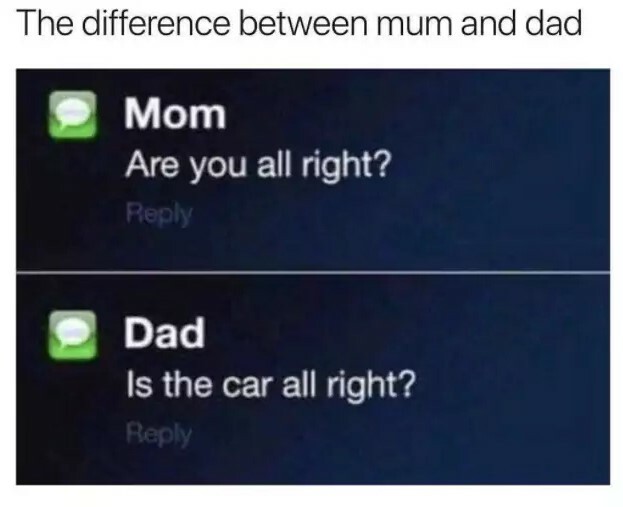 The parents in this image have very different priorities. The mother is concerned for the safety of her child. The father is worried that the car being driven by the child is intact. Considering the cost of auto repairs, the father’s position is somewhat understandable. If you have a sibling, you should try to be kind—you might need a kidney one day, after all. Regardless, the sibling in this case clearly does not care very much. This image is so sad. Cheating is wrong, and apparently children learn to cheat far too early. 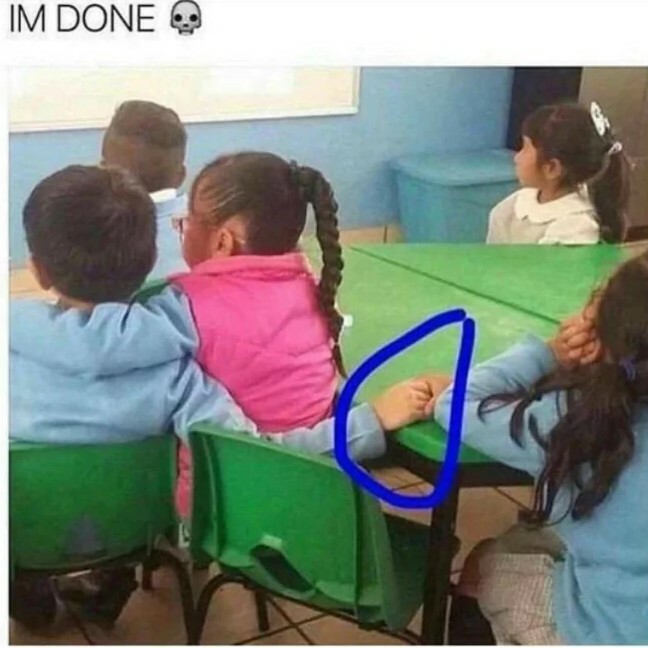 The little boy clearly has game, though, so that is pretty impressive. It is pretty funny how much the guy’s gut looks like actor Woody Harrelson; however, it is never cool to be mean to Woody Harrelson. From the day he appeared as Woody on “Cheers”, he has been a treasure. 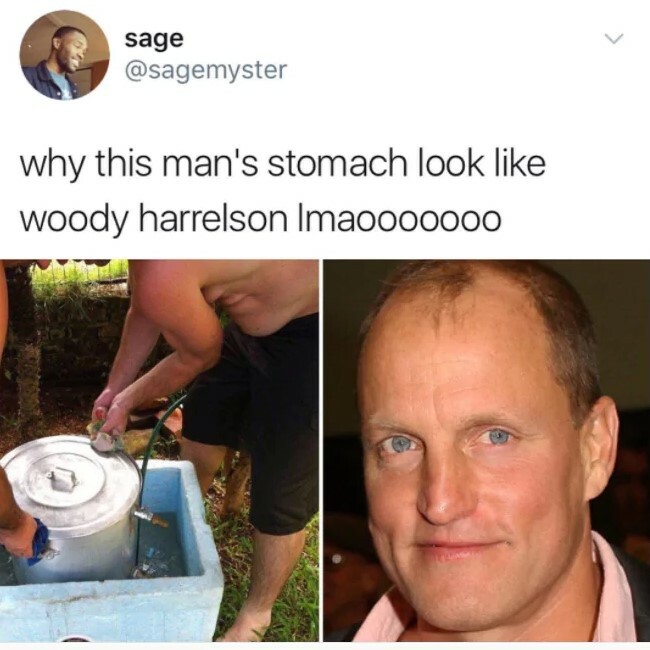 The guy’s in the picture’s gut may be disgusting, but Woody Harrelson is definitely one of the best actors and celebrities out there. 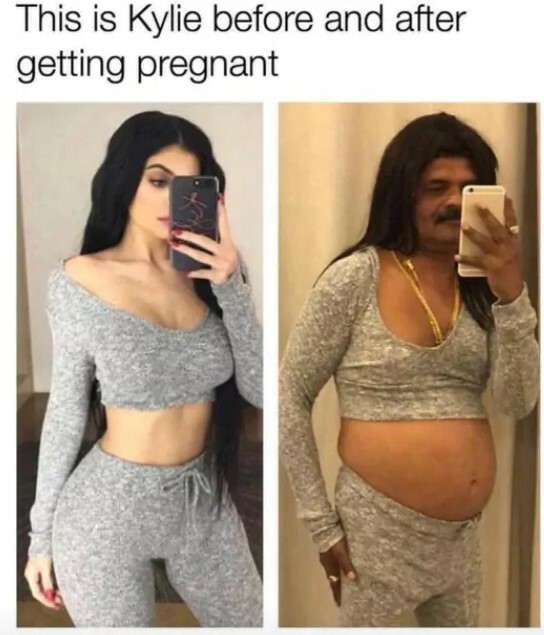 Any guy that would even consider going on a date with a woman who pretends to be pregnant needs to take a good, hard look at himself in the mirror. The woman also threatens to show up at his house, which is probably a good reason to contact law enforcement. That is just scary. 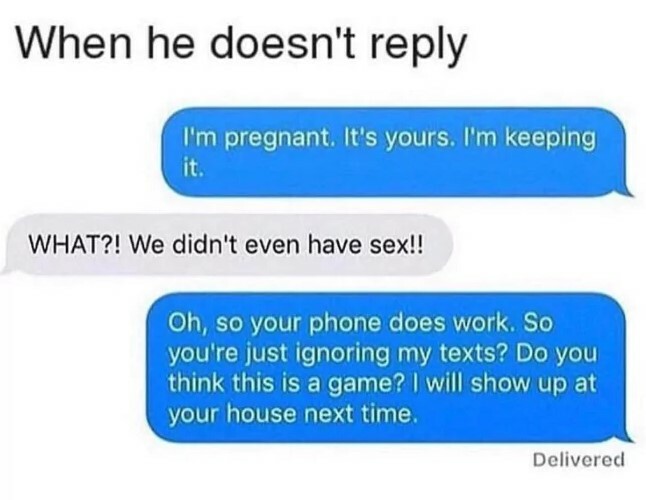 Her text, however, did result in a text back; you kind of have to give her respect for the approach. 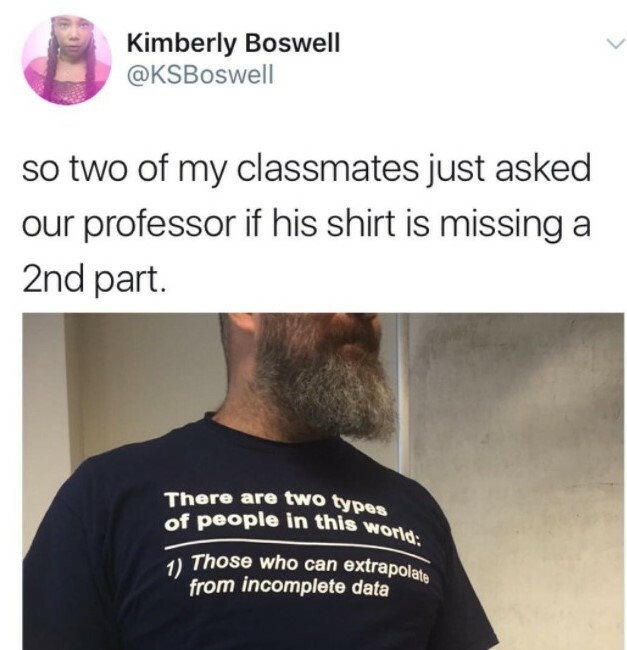 The professor in this case is not mean, but the shirt he is wearing is sort of mean to those who do not get the joke. Really, the t-shirt is more funny than it is mean. Joe is definitely a funny guy. His dinner at Taco Bell was, in his words, “worth it” even though he allegedly experienced gastrointestinal distress. 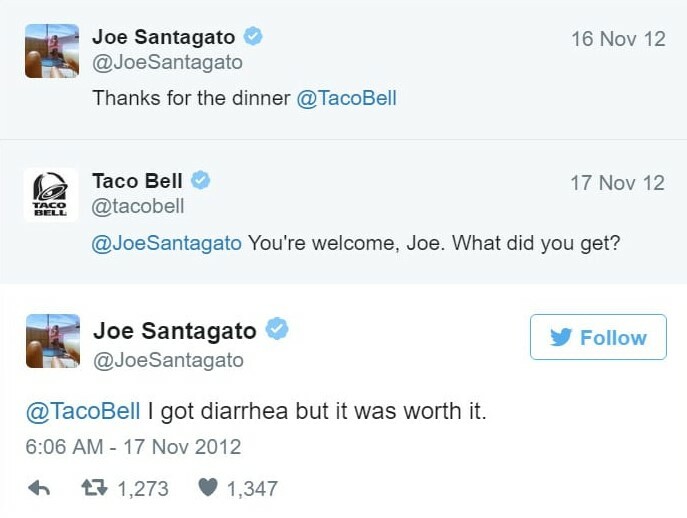 Taco Bell probably was not expecting his amusing response. 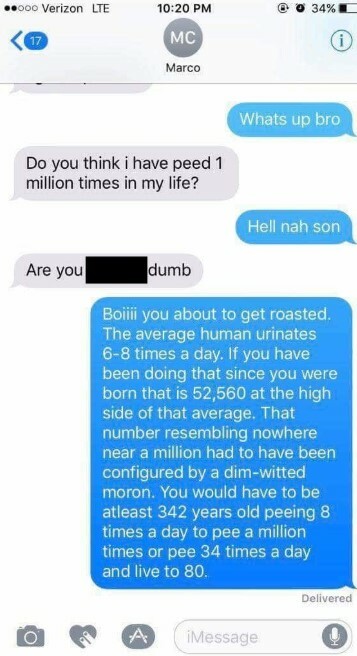 Apparently someone was wondering if he had peed one million times in his life. The person to whom he posed this question has actual math skills; you would apparently have to be really old in order to have peed that many times. It sometimes feels like you have peed a million times in your life, but that simply is not the case. Mothers are great and all, but they can be demanding. The “dad” in this exchange apparently agrees with this sentiment. To be fair to this “mean girl”, a lot of people are actually a lot more attractive if you are visually impaired and not wearing glasses. She was simply telling the truth—good for her. 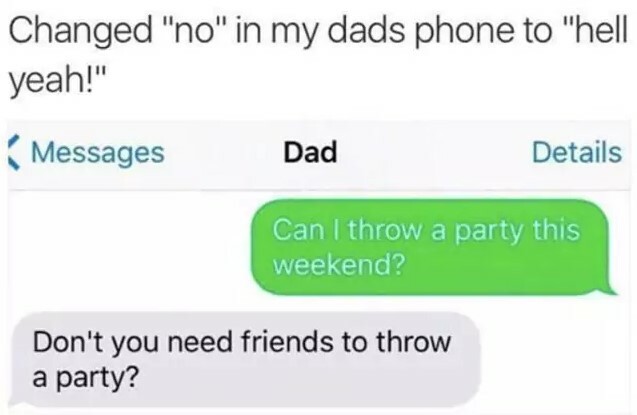 It must be rough when your own father points out you do not have any friends and therefore can’t throw a party. 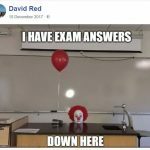 You would ordinarily expect your parent to support you and build you up, but sometimes a person really needs a bit of brutal honesty. This image is definitely pretty mean; the reality star, model, and socialite Kylie Jenner does not deserve to be made fun of so brutally. 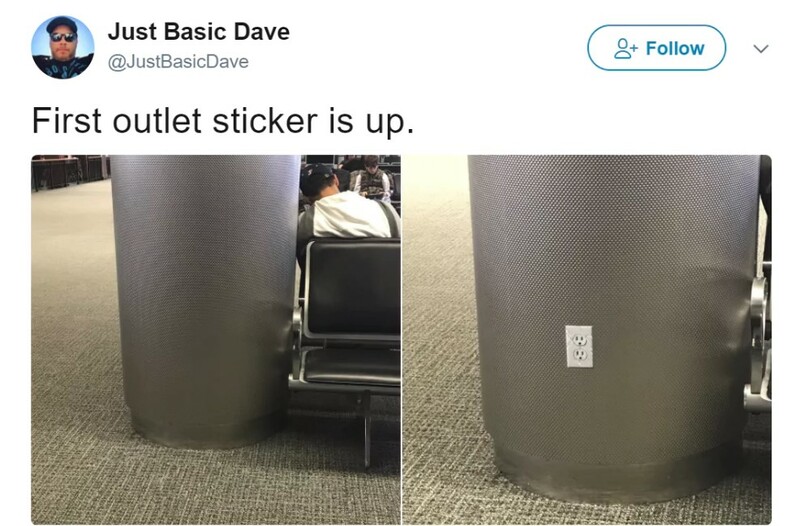 If the outlet in the image is a sticker, that is a pretty impressive and realistic-looking sticker. Can’t you just picture some confused person trying to plug in his or her laptop or phone charger? To be fair to Roman, he wasn’t really being mean. He was making a valid point. Why is that room so empty? 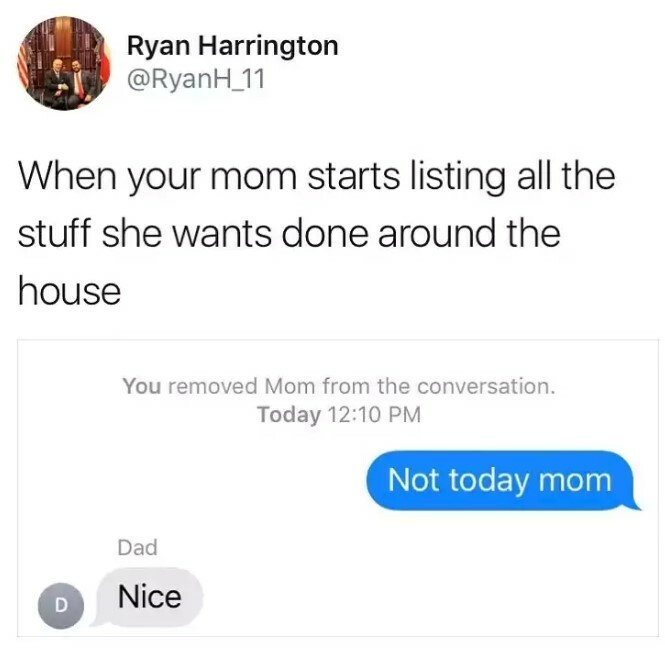 Did she just move in? 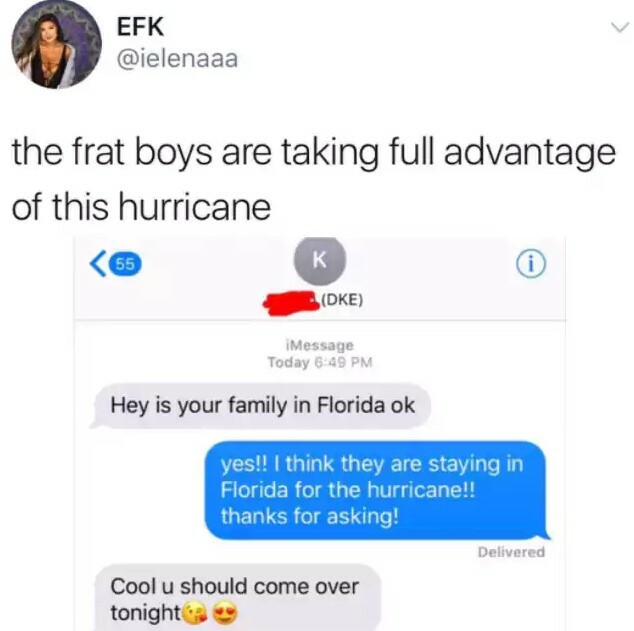 It takes a special sort of person to pretend you are concerned about a woman’s family in order to get her to go out with you.